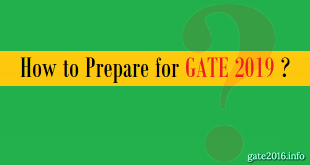 “How to apply for PSUs recruiting through GATE 2019 ? What are the name of PSUs recruiting through GATE 2019 ? What are the important dates of PSUs application through GATE 2019 ? 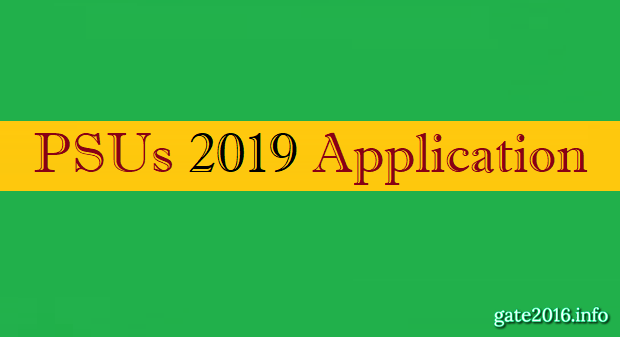 PSUs 2019 Application – The reason why PSUs (Public Sector Undertakings) like HPCL, BPCL, IOCL, NHPC, NTPC, PGCIL, GAIL,NALCO, MECL, MECON etc. accept GATE Score is because GRADUATE APTITUDE TEST in ENGINEERING (GATE) not only tests your technical skills, it tests your analytical & logical skills as well. You need to be very strong in fundamentals as repetition of previous year questions is highly unlikely. A good GATE score is your ticket to get PSU jobs in many Navratna & Miniratna companies. Here we willl talk about PSUs, Various Public sector undertaking (PSUs) are recruiting through GATE score for the post of engineer trainee or graduate engineers. In 2014 more than 10, in 2016 more than 20, in 2017 more than 25 and in 2018 nearly 30 PSUs will recruit through GATE 2018 score. From the previous years analysis we can concluded that GATE exam will provide you more opportunities than any other exam. These PSUs recruit as per their requirement i.e., number of posts, number of branch of engineering, branch of engineering for which they will recruit, totally depend upon PSUs. You can get all these information from our website or from their official notification. Here in the table below we will provide complete detail of various Public sector undertaking (PSUs) which are going to use GATE 2019 score. We will here update all basic information like opening and closing date of application form, number of vacancies, allowed branch of engineering, technology or science for recruitment of different-different PSUs through GATE 2019. You may check all the information for the year 2018-2019 using the table given below. # Note : As any Public sector undertaking (PSUs) will release their recruitment notification who are recruiting through GATE 2019, We will update that PSU recruitment related information in the above table. The total number of PSUs recruiting through GATE 2019 will increase as any new PSU notify for their recruitment. Some PSUs release their notifications before releasing GATE admit card, some after releasing of GATE admit card and some after GATE result. So candidates need not to worry about number of PSUs recruiting through GATE 2019. This list will always get updates and will always increase in number of PSUs recruiting through GATE 2019. For latest information and updates related to PSUs recruiting through GATE 2019, Please visit this page regularly. Here in the table below we will provide GATE paper wise PSUs recruitment List. We will update this table for PSUs which are going to use GATE 2019 score for their recruitment process. This list shows which PSUs are going to use which GATE paper (or code) for their recruitment process. You may check which PSU will allow which branch of engineering, technology or science for their recruitment using GATE 2019 score using the table given below. # Note : All the information summarized in the above table will be updated on the basis of various public sector undertaking (PSUs) recruitment notification in the year 2018-19 only it means using GATE score of the year 2019 only. Allowed branches of engineering, technology & science may be different or number of branches may be increase or decrease in future notification of any of these public sector undertaking (PSUs) for the year 2018-19 from their previous recruitment notifications. Thanks for recruitment through gate 2019 information. what is the difference between full time btech course and simple btech degree…? i am a student of dual degree course..does that mean i am not eligible for most of the PSUs? Full time B Tech Course means you completely include yourself in the course completion like regularly join classes and participate in related activities. Part time B Tech Course means you completed your course through distance education programme and did not join any regular classes. Dual degree candidates are allowed to fill PSUs application form. A dual degree candidate fill PSUs application form either in 4th year or 5th year of course. I have come across many sites. But this is the most informative site. All the information regarding all the exams. Also, the test series u made for TTA was helpful. I think u should change the site name, that will bring more visits because this means u were specified to gate 2016. Thanks for appreciating our work and also thanks for your great suggestion. Can iti fitter students apply psu ? Yes ITI fitter candidates can also apply for posts in PSUs. There are various PSUs which recruit ITI candidates too. This list of PSUs is for B E / B Tech graduates only. Thanks for your suggestion. We will try to implement it asap. this page gives a reliable source for people searching for PSU job notifications. Very good work. Im. In b.tech in petroleum 4 th year but appearing for gate mechanical coz started preparing for gate from 2nd year in mechanical branch when petroleum paper was not introduce in gate but last year petroleum was introduced by iisc. I have focused only in mechanical since then and got confidance in mechanical . So what should I do….? Can I apply to psu if I clear with mechanical…? Or m.tech in mechanical in IITs…? What should I do…I m confused…? Ultimately I want batter job and good pay ….please give some suggestions…! First there are certain rules to choose paper for GATE exam. Please read below article carefully. After reading these two articles you will understand this issue clearly. Obviously scope in ME is more than PE but you will face issue while you will use your GATE ME score for PSUs as well as M Tech. Until BSNL will not put any notification short/full on their official website we will not be able to show BSNL in this list. A very good website for getting all the info abt various exams n specially GATE. can physics candidate apply for PSU ? Yes only for PSUs which recruit Physics stream candidates. Till now 10 PSUs / Govt Organization have notified for recruitment through GATE 2017. Out of those 10 two PSUs / Govt Organization will recrui Physics graduates. It is Best website for PSUs 2017 applications information.